If you’re planning on taking a year-end break, you’ll need to get organised early. Summer is the peak season for accommodation across the country, so it pays to plan ahead. Fortunately, platforms like Airbnb offer access to a wide variety of unique accommodation across the country. For peace and quiet, or a taste of something new, it’s worth looking beyond tourist favourites like Cape Town and Durban. Why not try somewhere a little different? With Airbnb, people can connect with different destinations across South Africa, and discover somewhere new. Here is a selection of unique towns to consider for the summer holiday. This cultural destination can be found on the edge of the Great Karoo in the Western Cape at the foot of the Swartberg Mountains, and is a cultural treasure trove. Just over five hours’ drive from Cape Town or an hour and a half from Oudtshoorn, it’s accessible, at least in part, via the quirky Route 62, ideal for road trippers looking for a change from the bustling Garden Route. The town has a thriving foodie scene, whether you’d like to take a cooking class or dine at one of the many excellent restaurants. Locals love the the Showroom Theatre that offers weekly live performances (perfect for those who are too busy to go to the theatre at home) and movies on Wednesday evenings and Saturday mornings. For the more adventurous, the breathtaking Swartberg Pass is worth a drive, and the national park is dotted with caves featuring San rock art. But whatever you do, in the evening, be sure to look up at the stars—with little light pollution, the dark night sky is nothing like you’d see in any big city. 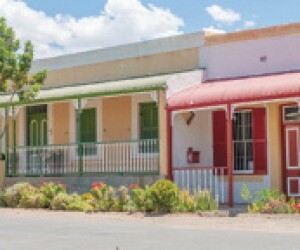 Graaff-Reinet is in the heart of the Great Karoo in the Eastern Cape and is, according to Graaff-Reinet Tourism, “a boundless and mysterious area covered by vast livestock and game farms, where broad plains roll away to distant koppies and multilayered mountains that seem to touch the indigo sky”. Just a 40-minute drive from Nieu Bethesda, it’s famed as the former home of Athol Fugard where he wrote many of his most famous works. Be sure to visit the Owl House museum, the home of Helen Martins whose story can be found in Fugard’s The Road to Mecca. Surrounded by the Camdeboo National Park, it’s the perfect stop from which to visit the Valley of Desolation. The region is also world-renowned for its richness of pre-dinosaur fossils. Locals love the fact that the town itself is a historical gem and boasts spectacular clear night skies, delicious Karoo food and a very laid back, relaxed atmosphere. Also in the Eastern Cape, located high up in the Amathole mountains, is Hogsback: a magical world of mountains and forests. Many people flock here for snow in winter, but in summer you can expect hot days, cold nights and epic thunderstorms. The village is a quiet retreat, perfect for artists, bird lovers (look out for long-crested and crowned eagles, as well as endangered Cape Parrots) and those just looking for some peace and tranquility. Be sure to visit Hogsback’s famous gardens featuring exotic plants from Australia, Europe, North America, the Himalayas, China and Japan. Or enjoy this mountainous region by walking, hiking or mountain biking. This picturesque town, surrounded by farmlands in the KwaZulu-Natal Midlands, has a little bit of everything ‒ beautiful surroundings, historic landmarks, wildlife conservation, country taverns, a wide variety of outdoor activities including adventure sports, and many of the arts and crafts shops the Midlands Meander is known for. While you are in Nottingham Road, be sure to check out the quaint and quirky cafes in the area where you will be able to cool down and refresh with something cold. A visit to the Nottingham Road Brewing Company, and the legendary Notties Pub, is a must. And locals with tell you that you should be sure to keep an eye out for the ghosts said to inhabit the area as a few tipples allegedly makes them easier to spot! The artist’s haven of Clarens, located between Johannesburg and KwaZulu-Natal in the foothills of the Maloti mountains, is known as the “jewel of the eastern Free State”. Here, you can enjoy incredible mountain views, stroll around quaint shops, sit and enjoy breakfast or lunch at a charming cafe, visit art galleries, take part in the wide variety of outdoor and adventure activities available in the area, or take a drive to explore the nearby Golden Gate Highlands National Park. From Clarens, it is also an easy drive to the mountain kingdom of Lesotho as the Caledonspoort border post is just 42 km away. With our country being so beautiful in so many ways, there are numerous places less well-known than the major tourist sites and well worth a visit.